For all you lovers of Chinese takeaway, Microgaming has created a game combining your favourite cuisine with your favourite casino game. Win Sum Dim Sum is filled with Chinese food themed symbols like dim sum, wontons, chicken feet and lotus rice along with standard A, K, Q, J, 10 symbols, and set within a Chinese restaurant backed by charming Oriental music. The game features heavy use of the colour red, which is deemed to be incredibly lucky in Chinese culture, so immerse yourself in this food inspired pokies game and see if good fortune is part of your foreseeable future. Win Sum Dim Sum is a five reel, nine payline video pokies game which contains two bonus rounds and a jackpot of 75,000 coins. While the game is available for free play in practice mode, to play for real money bets you’ll need to have a registered account with a reputable online casino like the ones recommended here at OnlinePokieGame.com. Once you’ve logged into your casino account and made a deposit, all you need to do to play Win Sum Dim Sum is set your desired bet level. Click on the ‘bet’ button and you can use the plus and minus symbols to customise the coin size, number of coins and number of active paylines. The minimum bet will cost you $0.01 per spin, while the maximum bet is set at $22.50. The auto-play function also allows you to play up to 500 spins without having to move a muscle. Win Sum Dim Sum is available in instant-play mode directly over your Web browser, so you can play using Safari, Firefox, Chrome or Explorer without making any downloads. Some exclusively Microgaming powered casinos, like Royal Vegas Casino, also offer the option of playing Win Sum Dim Sum using downloadable casino software. The bonus features in Win Sum Dim Sum are pretty stock-standard to the Microgaming repertoire, but what the features lack in uniqueness they make up for in winning potential. Wild symbol – the games wild symbol is the bamboo steamer, which substitutes all other symbols to form a winning combination, bar the scatter. The wild symbol also has the power to expand to award additional wins anytime it forms part of a winning combination. 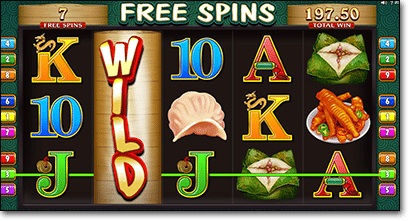 During the base game, the bamboo steamer symbol will turn into an expanding wild if it appears on reel three, while during free spins it can expand on reels two, three and four. Free spins bonus – free spins are triggered by an appearance of three or more of the tea pot scatter symbols, awarding up to 15 free spins which can also be re-triggered once to give you a total of 30 free spins. During free spins, the chance of landing an expanding wild is increased, making your winning potential higher. Win Sum Dim Sum is available at all leading Microgaming powered casinos, as well as selected multi-provider casinos. When it comes to the safest, most reputable instant-play sites, the verified casinos in the table at the top of this page get our vote for real money play. Sign up for an account with any of these casinos using our links to receive some awesome welcome packages, including bonus credits and free spins. Win Sum Dim Sum is just one of hundreds of Microgaming pokies games you’ll find online, and with single payline bets available from just one cent it’s affordable to all bankrolls. Is Win Sum Dim Sum worth your money? 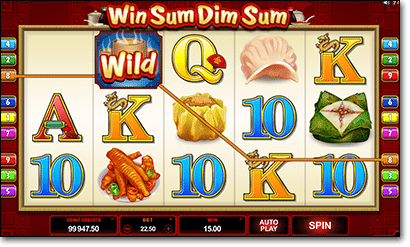 While Win Sum Dim Sum is a decent game which uses a fun theme, we’ve seen this game format used many times before in other Microgaming pokies. For veterans to online pokies, this theme may be a bit tired and your dollars could be spent elsewhere, but for newbies or dedicated Microgaming fans, there’s plenty of good reasons to play Win Sum Dim Sum. It’s an attractive, affordable game offering some hefty jackpots, and during free spins the variance seems to increase until it literally feels like money is being thrown at you, and for that it’s definitely worth a try.